Have you seen the new assortment of WonderGloss Nail Lacquers from Prestige??? These polishes are just gorgeous! The new WonderGloss Nail Lacquer line offers 27 new shades in a full spectrum of color. These polishes are super glossy and the formula is enriched with multi-vitamins for nail strength and durability. Plus, these polishes retail for only $3.95 each! What a deal!!! Here are the shades that I tried: Romance (a vivid hot/barbie pink) and Surf (a medium teal blue creme). I really like the coverage and the wear of these polishes. I used 2 coats and get about average-above average wear (4+ days...which, for me, is good! I have a toddler at home and am constantly washing my hands). Prestige Cosmetics offers not only this fabulous new WonderGloss line of Nail Lacquer, but also a wide array of makeup: from face and eye primers, to BB Creams and duo chrome shadows. 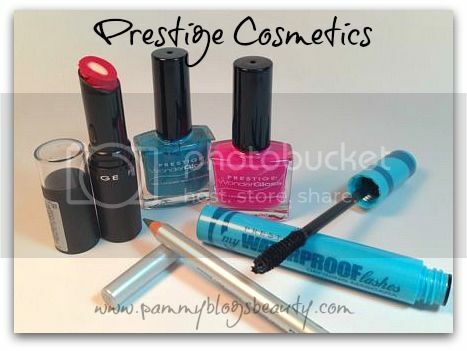 Be sure to scope out the selection of Prestige Cosmetics next time you are beauty shopping! 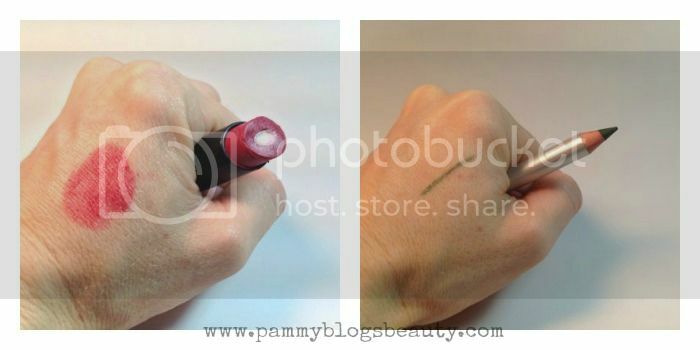 Classic Eyeliner in E78 Marble (a beautiful deep green): It applies smoothly and blends easily. It lays down nice pigment without pulling nor dragging the eyelid. These eyeliners retail for about $3.95. Color Persist Lipstick in LCP-O6 Enduring Blush (a deep pinkish red): The Color Persist lipsticks are longwearing lipsticks with a moisturizing inner core lipbalm. Formulated with vitamins and hyaluronic acid to keep your lips smooth and hydrated! Retails for $7.50. My Waterproof Lashes Mascara: Now, I must admit, I am not really a fan of this mascara. Generally, I am not a huge fan of waterproof mascaras in general. Personally, I found it to be a little bit clumpy and it did not resist the water when I went swimming. Retails for $6.95. I generally loved this assortment of Prestige Cosmetics! I am excited to explore this affordable brand more in the future!!! Are you a Prestige fan? What do you like from this line? The prices are amazing!!! $3.95 is a total steal!